Carl Bleile is accepting students for private instruction. Carl has been engraving since the early 70's and speaking with him the other day he mentioned he would be happy to tutor students for private instruction. Carl also has all the brands of equipment for students to work with. Phone or email him for more for more information. 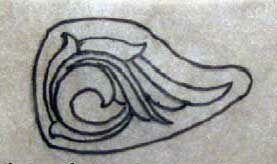 This is a tutorial Carl provided with his technique of sculpture/carving engraving. The tools he is using are the ones he developed the sharpening templates for. My name is Carl Bleile and I reside in Southwest Ohio. 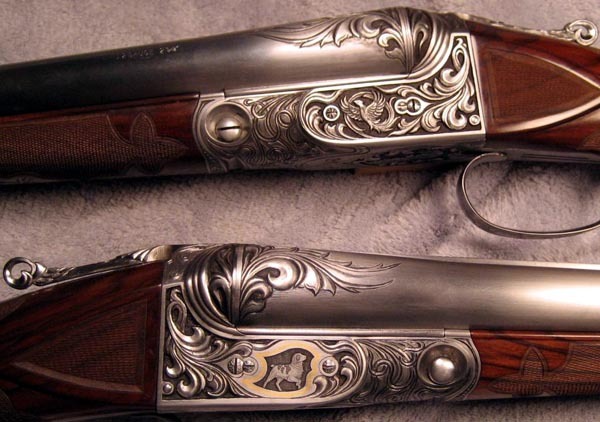 I have been professionally engraving since the early 1970’s. 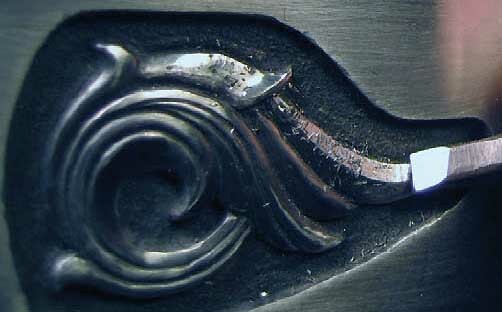 During my early years of engraving there were no reference tools or teaching available. My ability to engrave was self taught. 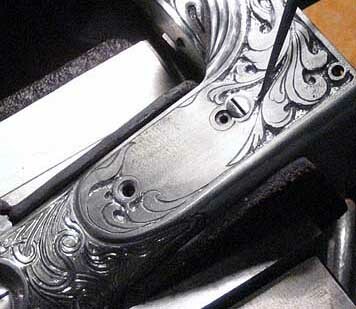 I spent many years learning by trial and error to develop my skills as an engraver. 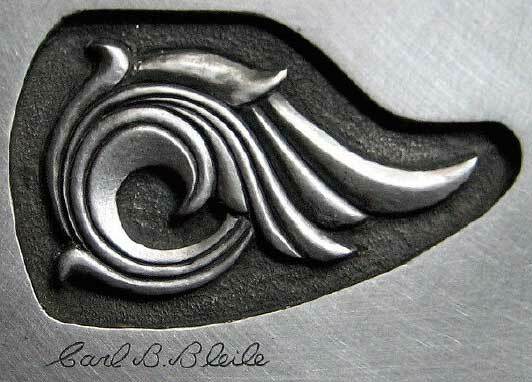 I have techniques, processes, tooling, designing and information that I would like to pass on to those who are up and coming into the engraving world. 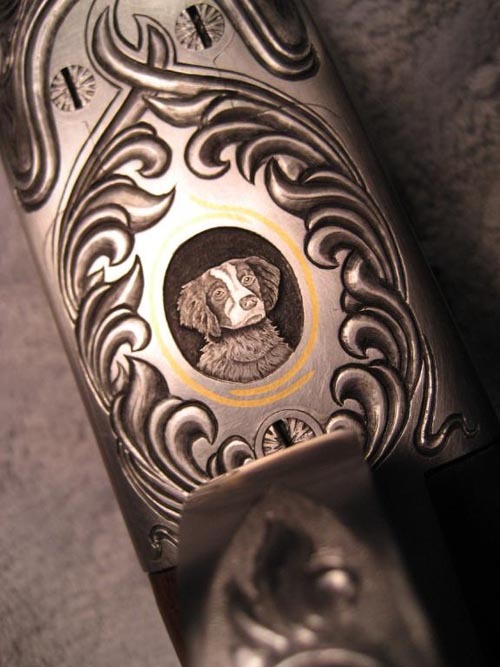 Master engravers of the past have taken their information with them when they passed on and this has resulted in a great loss to the engraving world. Below I share with you one of my many projects. Recently, I was working on an engraving job involving a set of Parker, A-1 Specials. 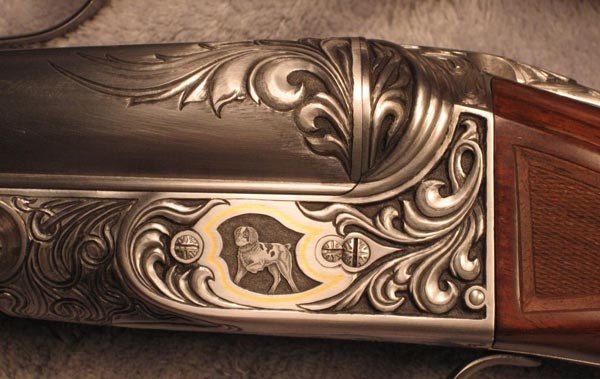 Knowing the guns were going to be cased colored I decided to do some sculpted deep relief engraving (as fine line & shading are often lost in the case coloring process). The sculpted deep relief design was mirrored on both Parkers. 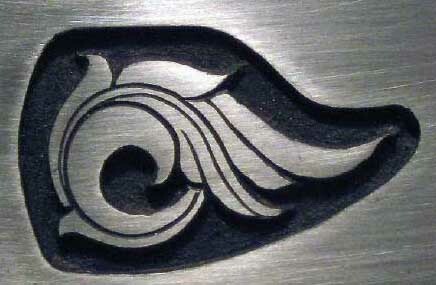 I wanted a flowing design with strong characteristics to show my engraving work. The pieces needed to have strong visual impact. I tried many different designs thinking in 3 dimensional (3-D) which would result in a more dynamic look after completion. The Parkers are made of tough steel which I sometimes fine better to work with than soft or very hard steel. As usual with firearms, I found it a challenge to layout the design on flat and highly rounded surfaces. Also cutting the two different surfaces presented another challenge and I had to adjust my tools accordingly. 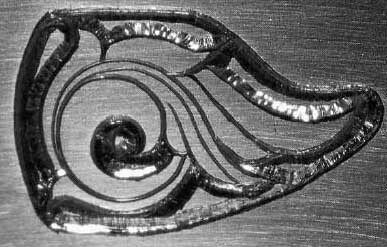 I photographed the Parkers and sculpt a practice plate for FEGA to show the progression of the work and to tell a little about how the engraving was done. 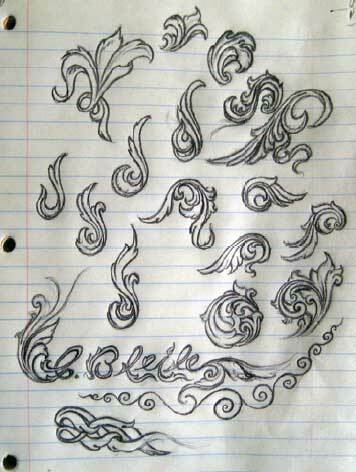 The scribbling of artwork enables me to develop the creation of designs. I cannot stress enough the importance of drawing. Keep in mind that you cannot cut what you cannot draw. Do not try to draw perfect – be creative and remember whatever scribbling you do is just a draft. You will learn from the good and bad points of what you do and this will add to your vocabulary of designs. When I find a pattern I like, I expand on it or refine it, until it is a useable pattern. 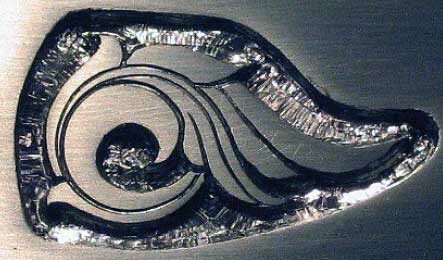 The design I have chosen for the practice plate is a relatively simple pattern to show my technique of sculpted, deep relief. After transferring the tracing to my whitening compound, I began to cut my outline with a narrow V tool. The outline, as it needs to be deep, may need to be cut twice. As I cut for sculpted deep relief, the heel will change. Essentially, the deeper I cut, the steeper and shorter my heel. When I begin to remove the background, I want to remove metal closest to the outlines with an angled cut, angled away from the outline. This allows me to keep from marring my borders. It is important to forgo removing metal up to the outline. This allows a margin of safety for crisp borders at a later stage. I will remove metal closest to the outline later during a cleaning up stage. Now that I have my bevel cuts, and the freedom to move without damaging an outline, what remains for the background are “islands” of metal. These “islands” are chiseled down and away, in an efficient manner, through different size flats. These flats will remove major amounts of metal quickly. As stated before, the deeper I cut, the steeper and shorter my heel. At this point I am going to matte the background. This enables a better reference for the end product. Since there will be ridges from removing the bulk of metal, a flat will be used to plane the background surface to a level finish. This planing will allow a smooth surface for the punch to matte the background. The matting allows two things to occur simultaneously: the background can be completed (except for any clean up needed later on), and now you can visualize the starting point of the sculpting process. 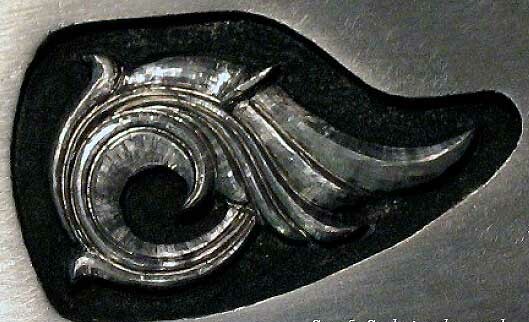 Sculpting is different from many other aspects of engraving as sculpting is based on the subject being three dimensional (3-D). Three dimensional has rules that are far different, and do not apply to two dimensional shadowing. They are completely different forms of artwork. Two dimensional work is a representation of the object portrayed through the use of shadowing. Three dimensional work is the sculpted object itself. As the actual sculpting aspect begins here, it is imperative to have a 3D mental image of the location, shapes and angles. In simple terms, remember where the highest and lowest areas are on the design. The highest areas have the least metal removed so begin removing metal in the lowest area that you want to be the deepest. The more contrast you have in the highest and lowest areas the greater the sculpted effect. 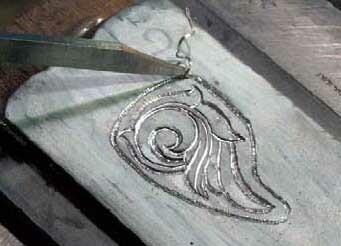 Remove metal throughout the design to get the general shape (rough it out). Whether it’s hammer and chisel or power tools do not be afraid to get in and remove a lot of metal. You want to get it out of the way quickly so you can get to the sculpting work. Expect to have tool marks as the object is not supposed to be refined yet. Less and less metal is removed as the object progresses. The detail should emerge as the object is refined. From the rough cut to the refinement of detail the use of flats, V-shaped and round tools create the 3-D depth and angles. The final step involves refining details. Borders and outlines should be made crisp and smooth. I personally remove all tool marks at this point with the help of a “scraping tool.” My “scraping tool” is a flat push graver with approximately 90 degree face with a cutting surface that is honed to a high polish. 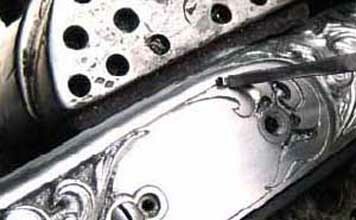 The scraping tool is used like a planer cutting off high spots in the metal in small increments. When there exists a ridge, or an angle that should be smoothly rounded, these very light cuts are applied. Again, this is shaving or planing metal so light cuts are a must to bring down those ridges or angles until there is a smooth surface or round transition. 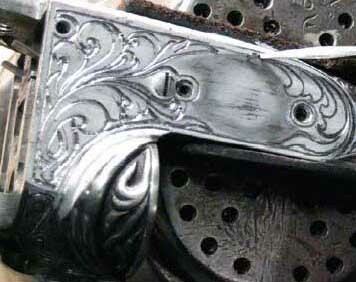 In the event that you desire a more tooled look omit the process of the use of the scraping tool. If an extra fine finish is desired, stones and/or a fine grinding compound can be used. The compound can be applied with a stick or a small piece of rubber like a pencil erasure. My final product emerges after these minor touches are applied. 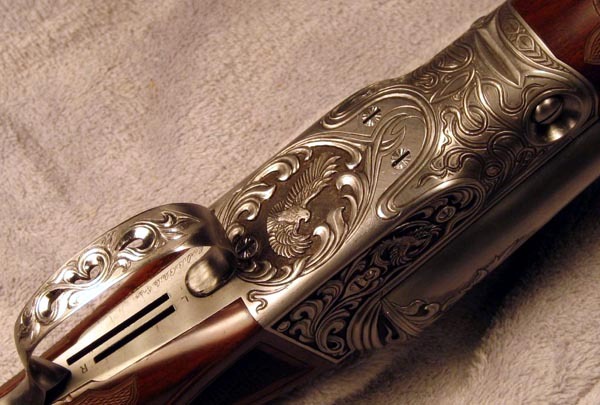 I would like to reference a famous shotgun made for Napoleon – which I saw many years ago that left me wondering “How was this done? It was a beautiful piece of artwork the same as a beautiful marble statue done by a disciplined artisan and looked as if it had been created by nature. No tool marks. No flaws. That is a fantastic tutor on sculpting. Bryan Bridges also does sculpting but I have not had a clue on how he does it (need more classes). Now I know (at least have seen) how it is done and how your tools are used and that is great. Needless to say your work is stunning and your templates to grind the gravers you used to make this work of art are on now on my "to buy list". Thank you so much for unselfishly sharing your skills with us and your efforts to teach and help us. Very nice Carl. I've always wondered how carving or scupting was done. It's nice to see a tutorial on this subject although I probalby won't be trying it anytime soon as I'm still a beginner myself. There's the importance of quality wood and fit. 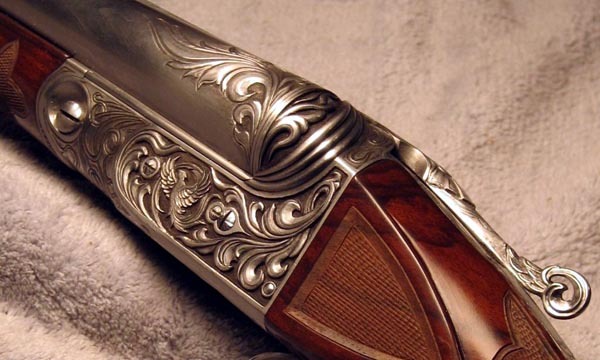 The types of wood and materials that are acceptable and desirable on different rifles and handguns and knives. How to present your work. What works in the custom market and/or the collector market. What sells and what does not and the reasons why. Details .... Carl gives helpful advice regarding the little things that can either make or break your project. 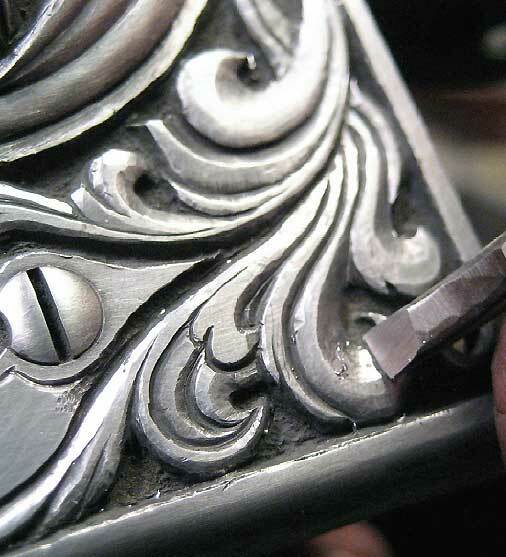 You will not only get engraving instruction, but art instruction and the ever important business guidance needed to make engraving work as full time career with confidence. What a wonderful Tutorial, very thorough, Beautiful Work. I'm bumping this up so it can be used as a reference for the deep sculpting post. No one to teach me out here! I am down under sydney australia, and there are presently no courses here.And there are few hand engravers. Is there a tutorial on inside rings engraving? I have not looked at your site for a while so I will see what I can come up with.Becides trying to learn I am doing diamond cut/engraved rings, which is oviously quite different. Hey Carl... I was just turned on to this "older" thread due to a question asked about another carved piece. Thanks for the info. What do you make your "scraper" tool from? What type of steel? does it matter? Thanks again. I've also learned alot from your Flare Cut article. Maybe I need to take some privete lessons from you. You've got my brother and me mixed up. I did the flare cut tutorial and met you at the Engrave-in and my brother started this thread. I believe Carl makes the scrapers out of HSS. You are correct Roger. Sorry about that. It's tough to have two great engravers in the family isn't it. I watched your tutorial several times and finally got the full set of your templates.I will soon start a small project but will need some advise and will be emailing you for help.I intend to use m42s on mild steel for this one. Carl that is absolutely beautiful! Thank you so much for show how it is done and describing the tools especially the scraper. Thank you again and great work! Thank you for this thread. Have a couple of small questions. I am deep cutting the background around some letters and used this thread for advise. I have done a bunch of the removing of metal with an NSK but it takes too much air to continue that way...have a silair 20A not big enough. So...I'm trying to get down deep with normal gravers and am running into a risk of damage to the edges from the graver. Quote: When I begin to remove the background, I want to remove metal closest to the outlines with an angled cut, angled away from the outline. What graver do you use and from which angle do you go at it? From the edge side, steep down? From the side? Or from the side towards the background? A flat? A universal? I'm stumped. Quote: After transferring the tracing to my whitening compound, I began to cut my outline with a narrow V tool. What is a V tool? Sorry...maybe you explained somewhere, but I can't figure it out. And getting the metal out of the inside of a "D" for example. That's a deep, small hole. How do you clean something like that up. These problems are stopping me dead and in essence, it is indeed a sculpting project I'm doing. Thank you Carl for your tutorial. I gave it a shot and it came out kinda rough. One of the hardest parts was the paint. Getting it to stay in the right spots and look straight and even, while in the correct groves. Also I only had a flat graver and a 120 so I need to get some supplies from you. If there is any advice you could give me from the pic I uploaded or on how to remove the paint easiest I would appreciate it. Your sculpting is amazing and thanks for your time sir. your welcome Josh, I never put paint in my engraving as it wont stand the test of time, its done by cutting to make shadows and deeper cuts , if for some reason I need something black it gets rust blued. before you stipple your background try to get it as flat as you can and use as many angles in your design as possible for shadows and to show contours.